We have had such an overwhelming request for more 1930's projects, that we are starting the Clothesline Club! We will meet monthly on the 4th Monday of the month from 1-4 pm. Each month we will focus on a 1930's block and it's history. We will also focus on a color of the month and hand out a scrap piece of reproduction fabric, that can be used in the next month's block. You can choose to make the focus 1930's block, or make a different one, using the scrap piece of reproduction fabric. By the end of the year, you will have made a minimum of 12 blocks to add to your 1930's quilt, and when people comment on your quilt, you can tell them a snip-it of history behind each block! Each month there will be show and tell, a teaching technique, history lesson, and time to sew! The cost is $20 for the year and if you bring a block each month for show and tell, you will receive the next month's pattern and color fabric free! Judy Larsen will be teaching the technique of how to color on fabric and embellish with thread! Now is the time to add a new dimension of your hand embroidery! Each month she will focus on a new technique or stitch, including exploring the color wheel, stabilizing techniques, expand your stitches and thread repertoire to add the WOW to your embroidery projects! This is a seven month club and we will start with Which Witch's Boot Pattern by Crab Apple Hill! Rosella Hanson, a certified Tucker University instructor, will be doing a seven month series of Tucker Technique Classes. This is the second in the series of 7. Learn to make perfect blocks using the Split Rects Tool Ruler. Learn the Studio 180 Design Tucker Tools in a hands on class. Bring your sewing machine and learn seven of the tools in a class taught by a Studio 180 Design Certified Instructor. Tucker Tools use a sew before you cut method to create blocks that trim up to the perfect size with a 1/4" seam allowance. Deb Tucker creates tools with the math needed to oversize blocks with enough room to trim them down. The tools included will be the Wing Clipper, V Block, Corner Beam, Tucker Trimmer, Square Squared, Diamond Rects and Split Rects. Each tool makes blocks in multiple sizes. Come and make the size (or sizes) you want and learn how to incorporate the Tucker Techniques into patterns you already own. As a bonus there is an optional project for each tool. Stop in the shop to see samples of the blocks and the optional projects. Classes taught by Rosella Hanson, who is a Certified Instructor for Studio 180 Design. She has a long sewing and quilting history and has been actively quilting for 30 years. She has taught classes, has a pattern line, Get the Point Quilt Designs, designed a Techniques Sheet for Studio 180 Designs and presents new ideas to other Certified Instructors. Rosella Hanson, a certified Tucker University instructor, will be doing a seven month series of Tucker Technique Classes. This is the second in the series of 7. Learn to make perfect blocks using the Split Rex Tool Ruler. Learn the Studio 180 Design Tucker Tools in a hands on class. Bring your sewing machine and learn seven of the tools in a class taught by a Studio 180 Design Certified Instructor. Tucker Tools use a ?sew before you cut? method to create blocks that trim up to the perfect size with a ?? seam allowance. Deb Tucker creates tools with the math needed to oversize blocks with enough room to trim them down. The tools included will be the Wing Clipper, V Block, Corner Beam, Tucker Trimmer, Square Squared, Diamond Rexs and Split Rexs. Each tool makes blocks in multiple sizes. Come and make the size (or sizes) you want and learn how to incorporate the Tucker Techniques into patterns you already own. As a bonus there is an optional project for each tool. Stop in the shop to see samples of the blocks and the optional projects. Classes taught by Rosella Hanson, who is a Certified Instructor for Studio 180 Design. She has a long sewing and quilting history and has been actively quilting for 30 years. She has taught classes, has a pattern line ?Get the Point Quilt Designs?, designed a Techniques Sheet for Studio 180 Designs and presents new ideas to other Certified Instructors. Our first machine applique project will be revealed on December 1st. Creekside Quilting is taking an exclusive dealer's project, making a sample, kitting the sample for purchase, and putting the sample on a flashdrive. You must purchase a Creekside Quilting flashdrive for $30 for one year of uploads. 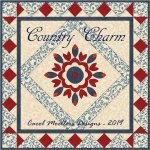 then every month we will release our Kimberbell design and you may either chose to upload the design on your purchased Creekside Quilting flashdrive or you can pass until another month. Each upload for the year is free. You will also get the opportunity to buy the kit each month to go with the Kimberbell project. Creekside Quilting will be offering the Patrick Lose Monthly Minis Machine Embroidery Applique Club! Anyone who wants to participate, will receive a monthly original Patrick Lose design project that can be made up into a wall hanging, pillow, table runner, etc. Each design has a tutorial and can be done using the satin stitch, blanket stitch or needle turn applique. The registration cost is $49.99 per year, which begins May 1, 2019 and goes through April 1, 2020. We will have kits available each month for purchase to go along with the monthly designs, if you want to purchase a kit. We might also do monthly sit and sew's on his projects if we receive enough interest. You may sign up anytime throughout the year, and receive back projects. Award winning Karen Burrier will be teaching her applique method of Turned Edge Applique by using a sewing machine with a technique that results in the look of hand applique! Learn skills to use a variety of shapes with circles, points, and indentation like hearts. This 14" tulip/flowers pattern will make a beautiful pillow. Karen will be teaching Sharon's Secret Foundation for applique method. Three 2 hour sessions. Come in for some May Day Fun! It's a make and take and we will be making this cute Patrick Lose May Flowers door hanging, which would look cute and welcoming on any front door! Bring your machine and sewing supplies, the cost associated with the class pays for the fabric kit! Is there anyone else who had Christmas projects or gifts they wanted to make last year and did NOT get them finished? I sure did! I'd like to be more productive this year and be ready ahead of time instead of waiting until November and burning the midnight oil! As a group, we will be motivated to get our projects and gifts done, so that each month we have something to show and tell with the group, and by Christmas completed projects! Bring your sewing, knitting, embroidery, wool applique projects and get started early! By starting in April, new Christmas fabrics should start arriving, which means...there is only 8 months until Christmas! Start early and be ready this year! Enjoy the fun and accuracy of paper piecing. Sharp points and perfect pieces will be yours with this easy technique that can be used for blocks of all size. Control for sewing small pieces and odd angles with perfect points will be yours when you sew on a paper foundation. We will experiment with this technique which will enable you to be more accurate than you ever dreamed possible. Patterns will be furnished for 4 different blocks to use for practice and to better execute the technique. Ever wanted to learn how to wool applique? Our award winning instructor, Patty Barrett, will teach you everything you need to get started in wool applique. This is sure to be a very informative and fun class! Class will cover information about wool, thread, basic stitches, and tools used. There will be practice and the completion of a project contained in a kit that will be provided.After taking the class, continue to practice what you learned at Wool Club on the second Tuesday of every month. Add needle-turn to your quilting skills repertoire. Learn basic needle-turn appliqu? techniques while making Welcome to Spring project. We will focus on the appliqu? stitch, easy curves and simple points. Award Winning Carol Moeller's will be teaching the applique technique of Turned Applique with Sewing Machine. She will be teaching this patriotic table topper she designed called Country Charm! If you have wanted to do applique but just did not know where to start, or maybe you don?t have the patients it takes to do needle turn hand applique. Well this workshop is one you will want to take to learn a fun and easy technique on how to do turned edge applique with your sewing machine that looks like it is done by hand. In the workshop we will make the lovely Country Charm table topper. You will learn how to have nice smooth curves, perfect circles, and sharp points on the tips of your appliques. If you have been afraid to work with bias, this class will also provide you tips to the secrets of dealing with bias edges. Hexies are popping up everywhere in sizes from 1/4 inch up. Learn the easy technique of English paper piecing and join the fun of this technique. This great take along technique will help you make accurate grandmother's flower garden blocks and a whole lot more. Hey Kids, have you ever wanted to learn to sew? Come join us as we set sail on this fun summer adventure with a series of classes especially designed for kids to learn to sew creative projects! Join Janice this summer for a fun sewing camp for kids ages 12-18. This is a fun and easy pattern to learn to sew and have a completed project by the end of the class to take home! We will provide the sewing machine and pattern! The student will need to bring their sewing accessory kit! We have had such an overwhelming request for more 1930's projects, that we are starting the Clothesline Club! We will meet monthly on the 2nd Monday of the month from 1-4 pm. Each month we will focus on a 1930's block and it's history. We will also focus on a color of the month and hand out a scrap piece of reproduction fabric, that can be used in the next month's block. You can choose to make the focus 1930's block, or make a different one, using the scrap piece of reproduction fabric. By the end of the year, you will have made a minimum of 12 blocks to add to your 1930's quilt, and when people comment on your quilt, you can tell them a snip-it of history behind each block! Each month there will be show and tell, a teaching technique, history lesson, and time to sew! The cost is $20 for the year and if you bring a block each month for show and tell, you will receive the next month's pattern and color fabric free!